Gabe is a transgender dad. And his daughter, Rye, is his world. Rye was around four years old when Gabe first started explaining to her that he was transgender and that he would be transitioning from mommy to daddy. “I just told her that I never felt right in my body,” Gabe said. “I let her know what kind of changes she may notice. And if she had any questions or concerns and if anything bothered her, she should let me know. Gabe said it was always a top priority for him as a parent to have an open, honest, and communicative relationship with his daughter, because that’s the type of relationship he always had with his family. When he decided he wanted to transition to live his life as the man he knew he was, that priority didn’t change. But Gabe was nervous. “I was always worried she was gonna get picked on at school. That was probably my biggest fear,” he said. But the issue never came up. Rye has never been bullied. Gabe’s gender identity isn’t a source of conflict for her or her peers. 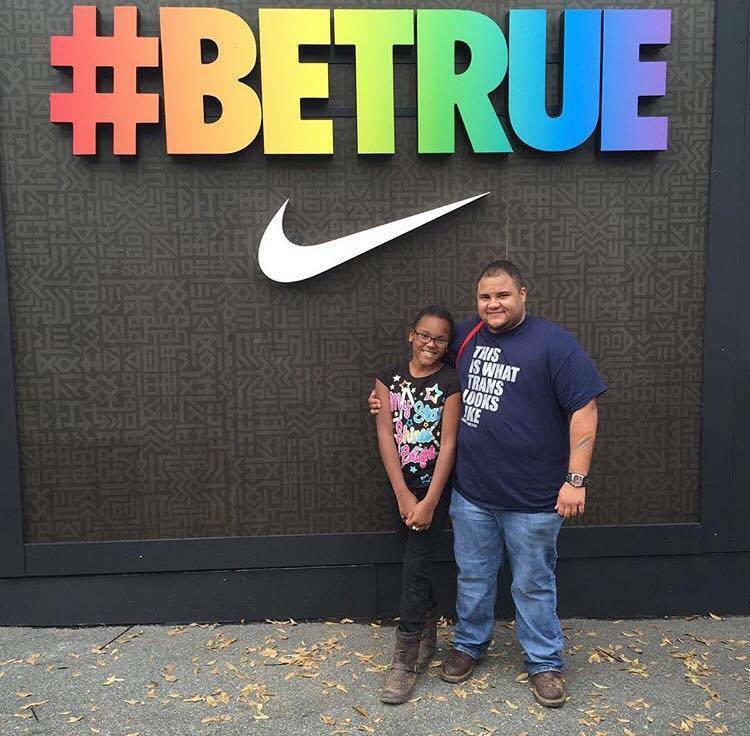 In fact, Gabe has always felt resoundingly accepted by his daughter—just as he is. Unfortunately, some of the adults in Gabe’s life were not so readily accepting. 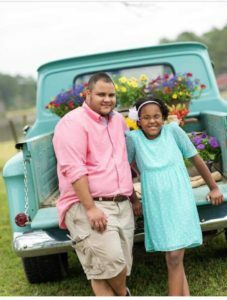 When he first started transitioning, Gabe was working at a small family owned restaurant in Douglas, Georgia, just a few miles from his hometown of Pearson. And his bosses were not supportive of his gender identity. The owner refused to call him by his preferred pronouns and chosen name—even after he had it legally changed. And they enforced a business-wide rule prohibiting other employees from calling Gabe by his name and pronouns. When Gabe’s bosses found out that one of his coworkers was referring to him as Gabe, the owner pulled her aside and had a one-on-one conversation so severe that he made her cry. Gabe said his bosses’ lack of support was incredibly hurtful. “There’s so much hate in the world why contribute more to it? I’m the same as anyone else,” Gabe said. Being from a town of just a couple thousand people, almost everyone knew one another. Gabe had grown up with his boss’s kids. He had frequent sleepovers as a child with his boss’s step-daughter, and they grew up to raise their own children side-by-side. He knew his bosses probably didn’t understand what it meant to be transgender, but he thought they would—at minimum—be accepting of him for who he is. His mom—who has been always been loving and supportive of Gabe—worked at the same restaurant. He recalls one instance when they were talking in a group with other employees and the owners, and his mom said she’d always wanted to work on a cruise. Eventually, after struggling with the verbal harassment and abuse for over a year, Gabe got the Transgender Law Center involved to help enforce the use of his real name at work. After five or so years at the restaurant—and one and a half years battling his owners for the right to be called by his legal name—Gabe took time off for surgery. And he never went back. Since then, Gabe has moved to Atlanta to accept a job at a real estate firm and pursue his real estate license. And this work experience has been polar opposite to his experience in Douglas. Gabe hadn’t anticipated his coworkers seeing the FTM feature story. So when people approached him at the office, seemingly out of nowhere, he was a little caught off guard. Ultimately, Gabe is really happy with his life now. He’s confident and well supported—both at work, and at home by his daughter, mom, and extended family. But his early experiences as a transgender person will always stay with him. He knows first-hand the harassment and discrimination that too many transgender people face. And he knows that, in Georgia, there are still no statewide laws to protect him from unfair treatment and harm. That’s why he’s sharing his story. To show lawmakers and everyday Georgians that transgender people aren’t that different—they just want to work hard, create a home, and live freely just like everyone else.